Sony has announced a PlayStation VISA credit card for the US market with advantages for users of Sony consoles. The players can benefit from its advantages when buying content related to the consoles. This card is intended for PlayStation users and can get additional credit for the PlayStation Store and points for the Sony Rewards rewards system. It is part of an agreement between Capital One and Sony Rewards. By using this card to buy games and content in the PlayStore, you get five times more points within the associated rewards program. It also has rewards for associating it with the payment of telephone bills, tripling the points that the user can get. Also, users of this credit card will receive discounts of 50% on their annual subscription to PlayStation Plus. 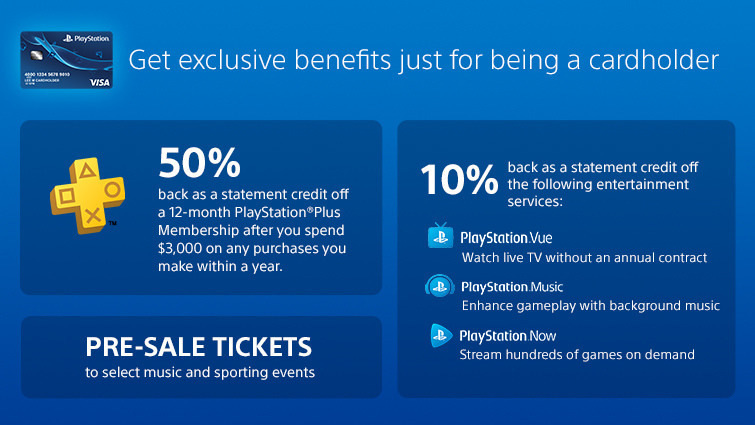 Plus 10% on PlayStation Now, PlayStation Music and PlayStation Value. It will reduce the annual expenditure of 3000 dollars associated with the account of this card. This card is offered without fees and with designs inspired by video games to choose by the user. This PlayStation VISA card has been granted with the company Capital One, so all members of the Capital One company can access it in the United States. For now, has not been announced for other markets, so we do not know if any agreement will be reached with other banks to reach users outside the US. Sorry Sony, but I’m not getting a credit card, even if it’s a PlayStation themed credit card. The reason why I avoid credit cards is because I don’t want to burrow money from the credit card issuer and then owe them the amount I spent. Therefore, I’m sticking with prepaid PlayStation Store cards. So thanks, but no thanks.